Does science inspire fiction or does it work the other way around? In the case of medical technology, the long-running TV and film series Star Trek has increasingly been inspiring researchers worldwide. Two teams were recently awarded the Qualcomm Tricorder X Prize for developing handheld devices that can diagnose a range of diseases and check a patient’s vital signs without invasive tests – inspired by Star Trek’s medical “tricorder” device. In the show, a doctor would use the tricorder and its detachable scanner to quickly gather data on a patient and instantly work out what was wrong with them. It could check organ functions and detect diseases and their causes, and also contained data on a range of alien lifeforms. But how close are we really to using such devices (assuming we don’t need them to diagnose aliens)? The main aim of the two prizewinners is to integrate several technologies in one device. They haven’t created an all-in-one handheld machine but they do both represent significant steps forward. The main winner, known as DxtER and created by US firm Basil Leaf Technologies, is actually an iPad app with artificial intelligence. It uses a number of non-invasive sensors that can be attached to the body to collect data about vital signs, body chemistry and biological functions. The runner-up technology from Taiwan’s Dynamical Biomarkers Group similarly connects a smartphone to several wireless handheld test modules that can analyse vital signs, blood and urine, and skin appearance. The judges said both devices nearly met the benchmarks for accurately diagnosing 13 diseases including anaemia, lung disease, diabetes, pneumonia and urinary tract infection. These are the most successful efforts we’ve seen to bring so many functionalities into a single, user-friendly, portable diagnostic system. Part of the success is due to the development of a variety of technologies that make up such all-in-one systems, although they still have some way to go. Probably the most advanced are mobile vital signs monitoring devices. For example, the ViSi Mobile System can remotely monitor all core vital signs including blood pressure, blood oxygen, heart rate and electrical activity, and skin temperature. It uses electrocardiogram (ECG) sensors attached to the chest and a pressure sensor in cuffs on the thumb and arm, both attached to a wearable wrist unit that feeds all the signals wirelessly to desktop or mobile device, with the same accuracy as conventional intensive care equipment. All the various sensor data from a system such as this then needs to be turned into meaningful readings – and that requires specialist software. For example, the Airstrip Technologies software can pull in information from hundreds of different types and brands of patient monitors and other equipment, as well as medical records, scan results and even messaging apps, to display a full picture of patient’s changing condition in real time. Portable imaging technologies are another element needed to assess a patient and present the relevant information. For example, there are already miniaturized USB-based ultrasound probes that can connect directly to a smartphone to provide instant ultrasound images. With the quality of mobile cameras and image processing capabilities continually improving, this technology is likely to get even better in the near future. This could mean instant X-ray scans or skin abnormality diagnosis using pattern recognition software. But vital signs information and images aren’t enough for a fully automated device that can tell you what’s actually wrong with a patient. The most mature technology we have in this area is for diabetes monitoring. Portable home blood glucose meters that can test a drop of blood on a paper can already be connected to mobile apps to allow diabetes sufferers to assess the severity of their condition. Meanwhile, completely non-invasive methods for measuring glucose that don’t involve finger pricking to get a drop of blood are under development. These include analysing sweat or the interstitial fluid located a few micrometres below the skin’s surface (above the pain-causing nerves). A number of innovative companies around the world are focusing on using similar handheld systems to diagnose other diseases, including HIV, tuberculosis, bacterial infections and cardiovascular disease. These rely on the key enabling technology of microfluidics, which uses specially designed microchips to manipulate tiny amounts of liquid. Commonly known as lab-on-a-chip technology, this allows you to reduce a complete clinical laboratory testing system to a device a few centimetres across. You can take a sample, prepare it for testing (for example by isolating bacteria in the blood) and identify and measure the microbe present. But while there has been significant progress in the developing bits and pieces of a tricorder, there is still work to do putting them altogether in a genuinely handheld package. Various equipment needs to be miniaturised and we need more progress in portable computers so they can handle all the information and data required for a complete picture of a patient’s health condition. We also need more development of the more thorough diagnostic features, such as the lab-on-chip and portable imaging systems, and less invasive testing methods. We may not have a tricorder in our hands yet, but we are definitely getting closer. By Despina Moschou, Prize Fellow in Bioelectronics, University of Bath. This was originally published in The Conversation under a Creative Commons Attribution No Derivatives license. Read the original article here. Bioinspired Materials for Medical Applications examines the inspiration of natural materials and their interpretation as modern biomaterials. With a strong focus on therapeutic and diagnostic applications, the book also examines the development and manipulation of bioinspired materials in regenerative medicine. The first set of chapters is heavily focused on bioinspired solutions for the delivery of drugs and therapeutics that also offer information on the fundamentals of these materials. Chapters in part two concentrate on bioinspired materials for diagnosis applications with a wide coverage of sensor and imaging systems. Chapter 12: Smart devices: Lab-on-a-chip is available now for a limited time on ScienceDirect. 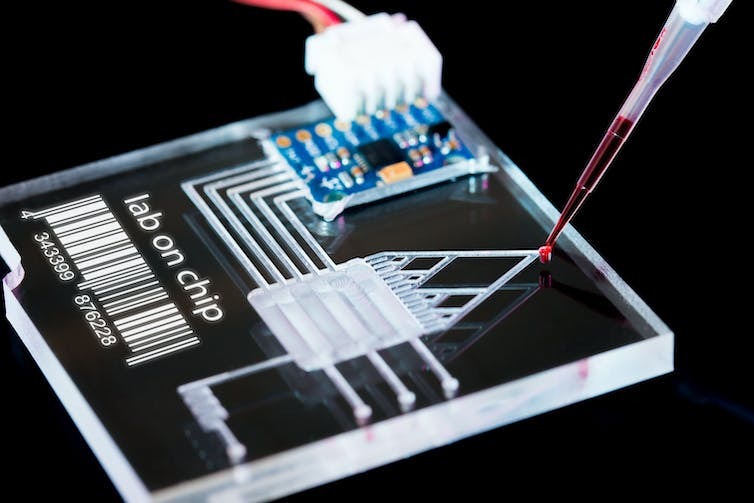 Microfluidic devices have become a reality in the healthcare sector for the analysis of (bio) chemical parameters and diagnosis applications, due to their small dimensions, accuracy, low cost, low power consumption, and portability. This chapter intends to discuss the main challenges regarding the application of lab-on-a-chip devices for diagnosis, from the miniaturization of microfluidics, to the materials, microtechnologies and on-chip integration of fluid manipulation and detection methods. In addition, this chapter provides an overview of successful diagnosis applications, including examples of analytical chemistry, particularly the detection of biomarkers for different diseases, evaluation of red blood cells deformability and HIV diagnostics. Need it in Print? Purchase on the Elsevier Store and get up to 30% off the list price with free global shipping. Apply discount code STC317 at checkout. Are Self-Driving Cars the Future of Mobility for Disabled People?